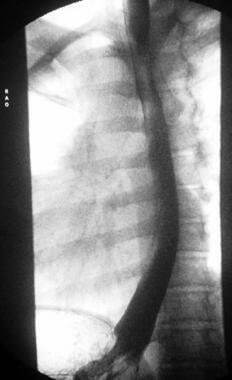 Gastroesophageal reflux at the level of the thoracic inlet is demonstrated on this barium esophagogram. In most of these people, endogenous defense mechanisms either limit the amount of noxious material that is introduced into the esophagus or rapidly clear the material from the esophagus so that symptoms and esophageal mucosal irritation are minimized. Examples of the defense mechanisms include actions of the lower esophageal sphincter (LES) and normal esophageal motility. When the defense mechanisms are defective or become overwhelmed so that the esophagus is bathed in acid or bile and acid-containing fluid for prolonged periods, GERD can be said to exist. Patients typically have numerous daily episodes of symptomatic reflux, including pyrosis, water brash or sour taste in the mouth, nighttime coughing or aspiration, pneumonia or pneumonitis, bronchospasm, and laryngitis and voice changes including hoarseness. In addition, objective evidence of esophageal damage can be seen on esophagogastroduodenoscopy. Presently, no role exists for computed tomography (CT) scanning, magnetic resonance imaging (MRI), or ultrasonography in the routine evaluation of patients with reflux disease. A conclusive diagnosis of reflux disease cannot be made by using barium esophagography. This technique is not sensitive for the detection of motility disorders. Nuclear medicine gastric-emptying study does not help in assessing anatomy and cannot help in the diagnosis of reflux disease. In patients with pulmonary symptoms, an infiltrate due to aspiration pneumonia may be seen. The standard radiologic workup of a patient with reflux disease does not require chest radiography. Upper GI contrast-enhanced studies are the initial radiologic procedure of choice in the workup of the patient in whom GERD is suggested. The primary use of an upper GI in suspected reflux is to evaluate anatomy and not to detect reflux, as sensitivity is limited in patients with known esophagitis and normal controls can have visualized reflux. Drinking 15-30 mL of iced water can improve the sensitivity and specificity for reflux. 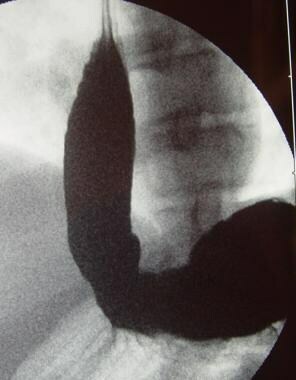 Barium esophagogram demonstrating gastroesophageal reflux with the patient in the supine position. 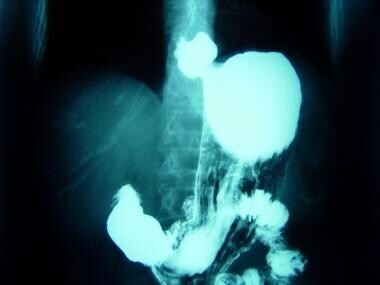 Reflux esophagitis is demonstrated on barium esophagogram. Various techniques are used, and each has relative strengths and weaknesses in the ability to detect specific abnormalities or disease processes. A typical barium esophagogram is performed in multiple steps or phases. A high-density barium suspension is administered, and double-contrast views are used for images taken with the patient in the upright position. Prone-positioned images are typically obtained with single contrast and a lower-density barium suspension. Mucosal relief images can be made to complement these techniques. The presence of Barrett esophagus occasionally is detected as a reticular mucosal pattern. As may be expected, the more advanced the esophageal disease, the more sensitive is barium swallow at detecting it. Early esophagitis is not well demonstrated and decreases the overall sensitivity of barium swallows, especially compared to tests such as 24-hour pH monitoring. This is why many clinicians reserve barium swallow for the evaluation of patients with GERD and symptoms that include dysphagia. Barium swallow is not sensitive in the detection of actual reflux, except in the occasional patient who has a wide-open LES and free reflux. 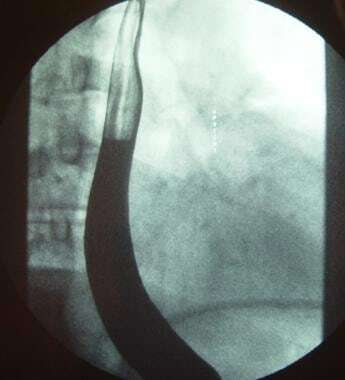 The degree of confidence offered by plain films for the diagnosis of GERD is low. A suggested diagnosis of GERD must always be confirmed by other, more sensitive and specific tests. No well-described, normal variants of GERD can be detected by using CT scans. CT scanning, similar to chest radiography, is not a part of the standard radiologic workup of patients with GERD. CT scans can provide information regarding the anatomy (ie, presence and size of a hiatal hernia) but do not provide information regarding the presence or absence of reflux. CT does not need to be performed in most of patients with reflux disease. No well-described, normal variants of GERD can be detected by using CT scans. Gastric-emptying studies may be worthwhile in the evaluation of patients in whom delayed gastric emptying is believed to contribute to the manifestation of GERD symptoms. Gastroesophageal reflux scintigraphy can be performed with acidified orange juice labeled with technetium-99m (99m Tc) sulfur colloid. Compared with fluoroscopy, this allows for a longer time of evaluation, a decreased radiation dose, and the ability to semiquantitate the amount of reflux. However, gastroesophageal reflux scintigraphy has little role in the adult patient due to limited sensitivity and the availability of other methods of evaluation. Gastroesophageal reflux scintigraphy is much more commonly used in infants and children due to the noninvasive nature of the study and relatively low radiation dose. In infants and children the study is often performed with labeled milk. In addition to evaluating the degree of reflux, pulmonary aspiration can be detected by imaging over the lungs. No normal scintigraphic variants for GERD have been described. Scintigraphic studies are neither sensitive nor specific for the diagnosis of GERD. The results should always be confirmed with another study, preferably upper GI endoscopy or 24-hour pH monitoring. Fock KM, Poh CH. Gastroesophageal reflux disease. J Gastroenterol. 2010 Jun 29. [Medline]. Richter JE. Surgery for reflux disease: reflections of a gastroenterologist. N Engl J Med. 1992 Mar 19. 326(12):825-7. [Medline].